#1 Where to buy a "Bonnet Hardware Kit"
Due to heat damage from manifold on my bonnet (or is it hood), the paint cracked and I have now removed all chrome parts, head lights etc. before the repaint. There are lots of missing washers between the middlesection and the wings and I really would like to straighten up the gap between those parts before painting, hopefully without a complete deassembling. So my plan is to carfully remove old bolt/washers, straigthen things up as good as possible and replace them. Does anyone know where to buy " Bonnet Hardware Kit" in europe, costs a fortune to ship it from U.S. If any Swede read this, I woud really would like to be in contact with someone restoring an E-type, just for having someone to ask where to buy parts etc. Please send me a PM if you are intressted. #2 Re: Where to buy a "Bonnet Hardware Kit"
#3 Re: Where to buy a "Bonnet Hardware Kit"
The one I bought recently from SNG Barratt had the wrong thickness spacer washers. Otherwise all the bolts are 1.4" UNC. #4 Re: Where to buy a "Bonnet Hardware Kit"
PS looking at the Monocoque offering, everything is supposed to be cadmium (these days ) zinc plated. So if you buy what they offer you's still need to replate all of it. #5 Re: Where to buy a "Bonnet Hardware Kit"
what was the thickness of the wrong spacer washers? I ask because I'm just installing a kit from SNGB and have no idea, what the correct thickness would be? #6 Re: Where to buy a "Bonnet Hardware Kit"
Thanks for the response, finally found it at SNG. You have to excuse me but It’s hard to search when you don’t know the correct term. An assortment of screws and washers. #7 Re: Where to buy a "Bonnet Hardware Kit"
I've just measured a couple of washers that I think are correct bonnet spacers at 2.5mm. The SNGB ones were a bit thinner and this made installing the bonnet trim strips difficult. #8 Re: Where to buy a "Bonnet Hardware Kit"
#9 Re: Where to buy a "Bonnet Hardware Kit"
I already bought those washers before I decided to change some more,and can confirm that SNG Barrat's are 2mm thick , at least if one buy them separately (probably the same in the kit). I will try to fit some of them and see how difficult it is to fit the brass clips before buying a whole kit then. #10 Re: Where to buy a "Bonnet Hardware Kit"
I bought one of Chuck's kits (with a lot of freebies thrown in). I'm not bothered about retaining the authentic cadmium finish etc. Bear in mind his kit has almost everything you need to bolt a whole car back together again. Too many parts have at best a "Friday afternoon" quality to them (which I suppose is at least authentically in keeping with 1960s/70s UK manufacturing standards), and many are downright wrong or shoddily made. When you take into account all the man hours putting out-of-spec or shoddily made things right, importing high quality stuff which is right first time makes a lot of sense. I should also stress that there are many UK suppliers who make things of excellent quality - E-Type Fabs etc - and who stand by their products. Yes, the bolt kit costs a bit more to import from the USA what with duty, VAT and P&P. But such is quality and the fit, that I am happy to have paid the extra money. I think I will end up saving money. I am sure other bolt kits will, more or less, do the job but, given that restoring an E-Type is normally a one-off job, price (within reason) should, in my view, come second to quality. #11 Re: Where to buy a "Bonnet Hardware Kit"
I have send Chuck an email regarding his bolts etc kits. Since I’m planning to slowly overhaul my cat I do need some bolts, washers etc. and having them all on my shelf will make things easier... to me the cost for this kind of things isn’t an issue as long as it’s quality parts. #12 Re: Where to buy a "Bonnet Hardware Kit"
We have done a bit of research into this subject and can advise what we think on the washer thickness. We think an original spacer washer for E-type (Part number C10193) is circa 1.99mm thick. This measurement comes from a "barn find" type car that we use to measure original parts. The parts that we stock both in the BD36166FK kit and as the part number on its own is coming in at 1.96mm. Given a there is a bit of residual paint on the original we are happy that our washer is within tolerance of the original. I have attached a couple of pictures for reference (the washer with the red edge is original) on this and hope that this is helpful. #13 Re: Where to buy a "Bonnet Hardware Kit"
This just proves the value of having Julian active on the forum. #14 Re: Where to buy a "Bonnet Hardware Kit"
Bear in mind that all Jaguar original parts were manufactured to imperial measurements (e.g. 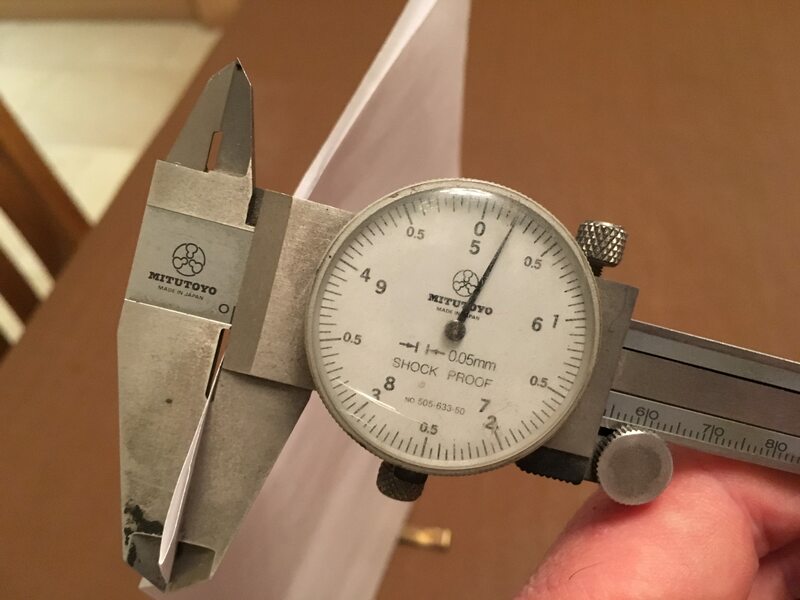 1.99mm = 5/64"). 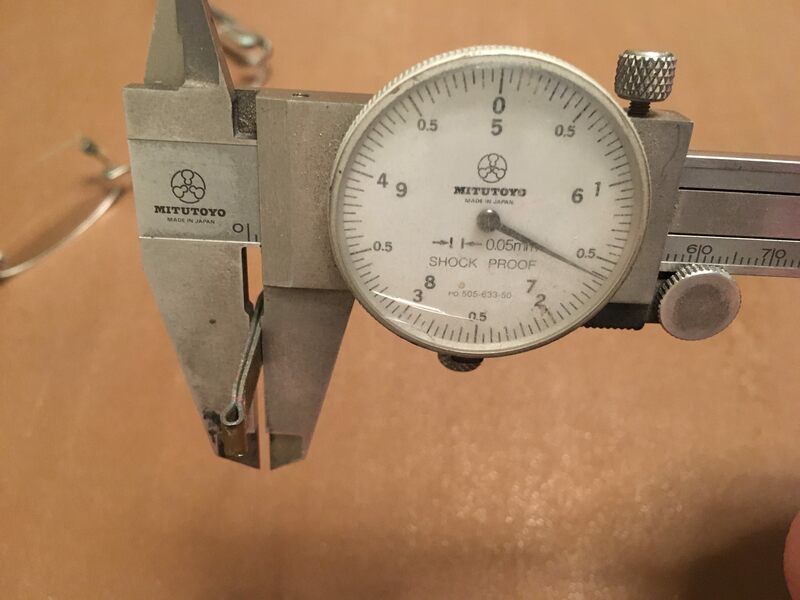 Modern manufacturing is built around the metric system so you can expect differences as they round up or down to whatever stock they can purchase. This was a major problem with clutch servo seal kits which were manufactured in China I believe. They were made to the closest metric measure but were undersize for the original servo bore, hence they leaked. To get steel or other stock made to imperial measure for use in E-Type parts would be hugely expensive so there has to be a compromise somewhere. #15 Re: Where to buy a "Bonnet Hardware Kit"
Steel rolling thickness tolerances are typically plus or minus 0.05mm, or 0.002", so this would pretty much cover the variation found. My concern is more regarding the material properties and chemical composition and I think I'd be right in saying that this is probably where most of the quality issues lie. Simply making comparative measurements is not good enough. I have a few original washers and have carried out comparative bend tests and found the originals to be much stronger. #16 Re: Where to buy a "Bonnet Hardware Kit"
#17 Re: Where to buy a "Bonnet Hardware Kit"
What is this supposition based on? Some apocryphal legend that everything was done on the cheap? You don't build award winning quality motor cars that stand the test of time by scrimping on the engineering. They may have used commercial grade components where it made sense but that doesn't mean they were in any way inferior. As I said, the rolling tolerance on the strip material these will have been made from, then as now, is + or - 0.002". That is a mill tolerance, not an OEM figure. #18 Re: Where to buy a "Bonnet Hardware Kit"
For what it’s worth, the spacer washers I removed which looked original were the same as Andrew’s (Abowie) at 2.5mm hence re using these rather than the repro ones. Bonnet washers are one thing but I have to say with regard to the tolerances and material spec of safety critical items such as brakes, steering and suspension, a bit of a “compromise” as David suggests, may not be quite so acceptable. #19 Re: Where to buy a "Bonnet Hardware Kit"
#20 Re: Where to buy a "Bonnet Hardware Kit"
Something to bear in mind Peter if you are using Barratts 2mm washers, or any 2mm washer, is that the chrome bead fixing tabs are 1.6mm thick. This will leave you with 0.4mm for paint. To put that in perspective a sheet of 80gsm paper is 0.1mm so you need no more than two sheets of paper thickness of paint on the adjoining panels. 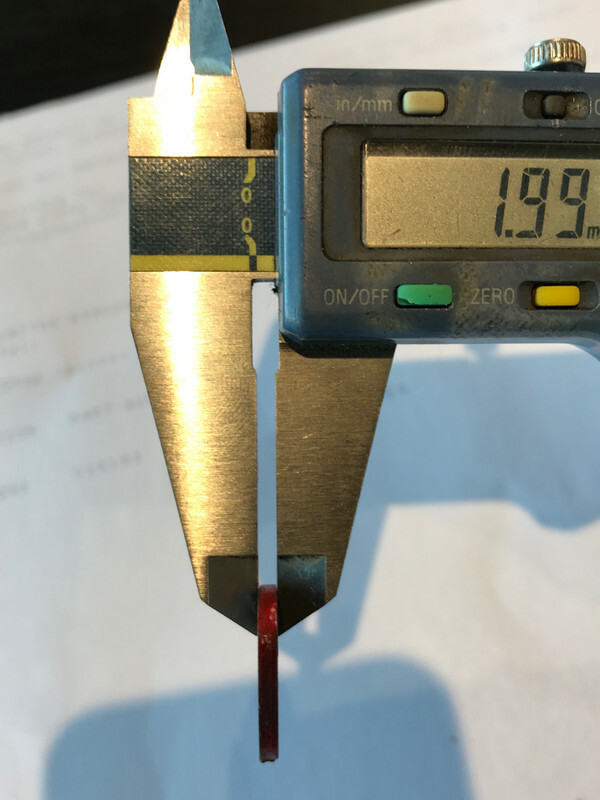 As an example an average modern car has a paint thickness of around 120 microns or 0.12mm. Something like a modern Bentley has around 230 microns ,0.23 mm. At this thickness your fixings will be difficult to push through the slot without damaging the paint. 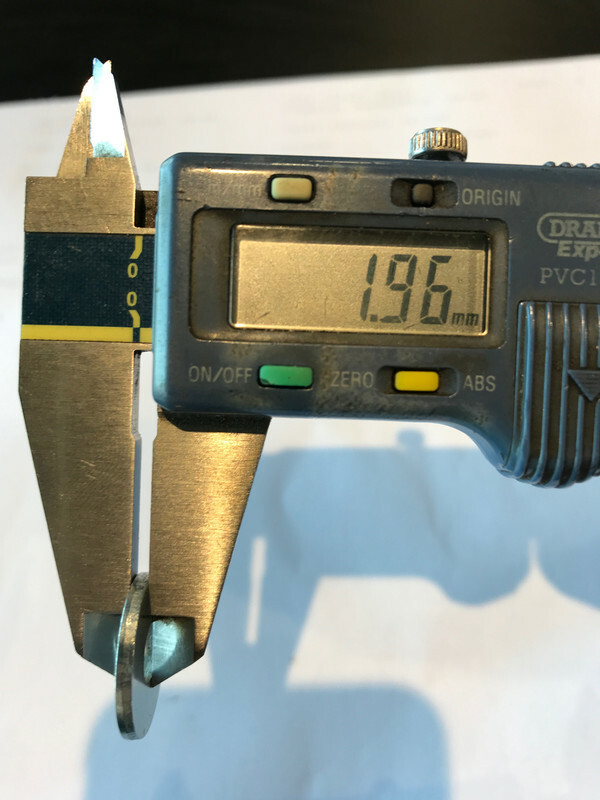 Things would be further complicated if a supplier of the fixing tabs rounded up to metric 0.9mm sheet giving an overall fixing thickness of 1.8mm and only 0.1mm per panel paint tolerance per panel. All seemingly unimportant dimensions on something as insignificant as a bonnet washer but potentially a little frustrating when you are chipping paint off your lovely newly painted and expensive bonnet.